If you live in the Charlotte/Lake Norman area and you haven’t been to Carowinds, you’re doing it wrong. Carowinds is one of North Carolina’s most popular amusement parks and is located just off Tryon Street in Charlotte, less than an hour drive from the Lake Norman area. Carowinds is open seasonally from March until October, and additional days throughout November and December for their Winter Fest. You can buy daily or group tickets, season passes, fast passes (skip the lines! ), drink and dining packages, and FunPix packages to capture your entire day at the park. Although pets are not allowed inside the park, they do provide a pet kennel FREE OF CHARGE to guests to drop their pet off at arrival and pick them up when leaving. What a great way to have fun without being pre-occupied with the thought of your pet being home alone! There are numerous ways to enjoy Carowinds for the whole weekend, or an extended amount of time. With a camping lodge right next door, and plenty of nearby hotels to choose from, some with a discount package when you buy admission tickets at the same time, you can bring the family and/or friends and take your time to enjoy ALL the attractions! Plus…a new Carowinds hotel coming in the Summer of 2019! Throughout the months of September to October, Carowinds magically transforms into “Scarowinds”, a haunted attraction for those thrill-seekers who just love Halloween. In fact, Scarowinds is said to be the Carolina’s largest Halloween event! Carolina Harbor is the water park at Carowinds…see what kind of splashes you can make here! 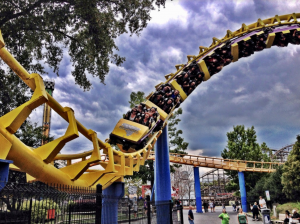 What’s your favorite ride or attraction at Carowinds? Let us know in the comments below!